I think it is SO funny how much food affects my everyday decisions. For a long time I would emotionally eat based on the actions of my day. The people at the Waffle House, Popeye's and McDonald's up the street from my on-campus apartment knew me and my friends on a first name basis because we would frequent their establishments just that much! Along with my trainer comes a whole new lifestyle with my eating. It's part of my New Normal! Read the post to see what I am no longer putting in my diet. Recently, people have asked me, "Rickey, since you can't eat all those things... what can you eat?" Well, I am so glad you asked, because when I was first put on this new regimen, I thought the same thing. I soon realized that there is a multitude of things that I can still eat, that are equally as delicious, but a heckuva lot more healthy. 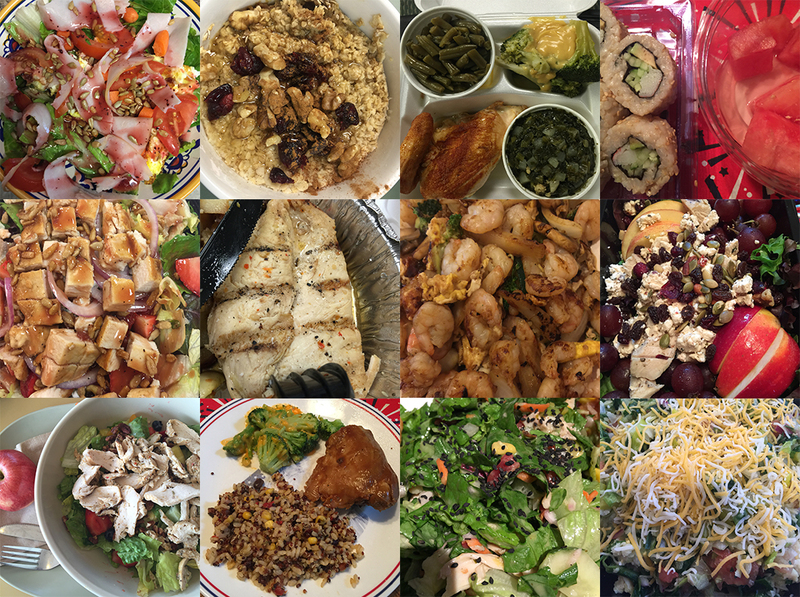 Below is a collage of just some of the meals that I have been able to eat since I've started my lifestyle. I have some newly discovered tips that have helped me to diversify my eating, and truly take hold of living healthy! I'd love to share those with you! 1. Make it Colorful: As a child, we always heard that a colorful plate was a happy plate. I understand fully what that means now! Before adopting my new lifestyle, I saw that white was truly the main color on my plate. White bread, white pasta, white rice, it was all starting to look a little bland. I see now that when they told us to make our plate colorful, it helps us to eat more healthy. A red tomato, orange baby carrots, crispy green romaine lettuce, fresh blueberries, and violet grapes have all increasingly become more of my diet. The crispy lettuce helps me achieve that crunch that I miss from eating potato chips. The violet grapes help by giving me a natural sweetness, as opposed to a really unhealthy sugars in a piece of cake. My life is filled with color already, so adopting a more colorful plate wasn't difficult. The only white I really eat now is white meat chicken, and an assortment of white cheeses! 2. Take a Photo: Every time I eat, I have to take a picture of my food. Not only is it a requirement of my trainer, but I love to do it just to remind myself that I have to push forward. When I take a picture of my food, it puts special emphasis on making sure my food is pretty. Everything in life has to be pretty (for the most part), espcially food. When your food is set on a pretty plate, it truly cascades out at you, and you want to enjoy every bite of it. A little of my obsession with pretty food, comes from my mother. My mom is the queen of good-looking food. She's so gifted, she can make chiterlings look good (and that's pretty difficult). Taking the time to prepare my food to the highest quality, and thoroughly enjoying it helps me to eat healthier and actually digest my food. Another source of my obsession with pretty food comes from my work at the Augusta Country Club. Chef Marvin and the staff are really sticklers for pretty food! Everything that touches a plate at the ACC has to be eloquently placed, which makes the food that much more enticing. Taking a photo of the food before you enjoy it really does help you eat healthier, becuase if your food isn't picture worthy... do you really want to eat it? My friend, Leah has a food blog called Stellar Foodie, where she chronicles her life in New York eating some of the most delicious looking food I've ever seen. Despite my new found love for healthy food, I may have to have a cheat day with Leah whenever I make it to NYC. 3. Have An Open Mind: With anything in life, you must have an open mind when it comes to trying new things. If I didn't have an open mind to wanting to be healthier, I honestly wouldn't be on this journey. I have friends that are appauled when we go out to eat, because I always order a salad. They look at me with the most confused look, because I'm trying these beautiful new things. As a child, I never turned down the opportunity to try new things, especially food! Every year in Augusta, we have the Arts in the Heart of Augusta Festival, which is full of food vendors from countries all over the world. I loved going, because I really got to be cultural and experience something new... and yet my friends would always order food from the United States. I realize that some people's tastebuds just aren't geared like mine, however, I find that trying something new helps me to eat healthier too, because it allows me to experience something new, and tailor my next food options based on that. 4. Get to know your body: When I started trying to eat healthy, I thought there was no way that a salad could fill me up. I thought I had to have steak, potatoes and the whole nine to get full. Now that I have started going to the gym, as well as light snacking throughout the day, I realize that eating lighter at meal time is what my body wants. I have seen where my body says, "I've had enough" and I have to accept it and move on with my day. It's difficult, becuase you want more, however, your body knows what's best for it, so listening to it is only beneficial for you. 5. Explore, Explore, Explore: What I have found is that I have so many healthy options at my disposal. One of my favorite options for meals is Panera Bread! While bread is on my no-no list, Panera still has plenty of options for me! The Strawberry + Chicken Poppysead Salad with an Apple for the side... one word... FAVORITE! Finding places with options that you genuinely enjoy obviously help you eat healthier, because you know you always have a few places to go with options for your healthy tastebuds. These tips have definitely helped me to eat more healthy, and actually take care of my body and monitor what goes in it. I will definitely be sharing more tips as they come about. For now, I am sticking to what I am doing, and continuing to look forward.